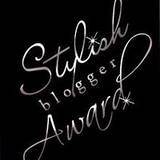 KWCardDesign : Stylish Blogger Award! It was also really nice to learn more about you in those questions. I am also very addicted to butterflies. LoL... And I love the names that you have for you two cats. How very adorable!